A week long ONC maintenance expedition in October was dedicated to servicing systems on the VENUS Observatory. It was conducted on board the Canadian Coast Guard Ship Vector. Remotely Operated Vehicle (ROV) services were provided by Canpac Divers Inc., operators of the ROV Oceanic Explorer. The program was a combination of recovering completed experiments, servicing of instruments, and the introduction of a new forensics experiment. The cruise started in the Strait of Georgia at the Fraser River Delta Node, where both the Delta Dynamics Laboratory (Natural Resources Canada experiment) and the test hydrophone array (ONC Innovations test demo) were recovered for maintenance. Another test demo hydrophone array recovered at the East Node location before the ship returned to the IOS dock that evening. 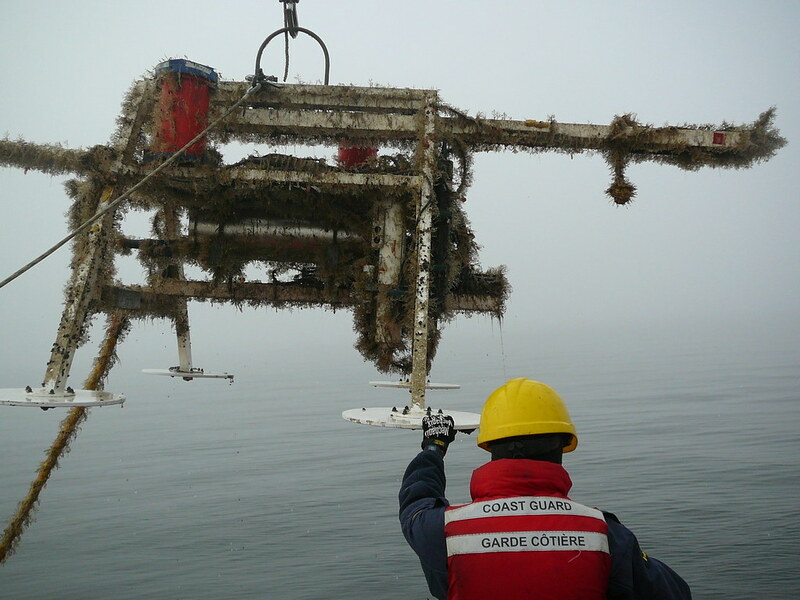 With the two hydrophone arrays safely on shore and in the hands of Tom Dakin and his team of engineers, the focus of the expedition then shifted to Saanich Inlet and the recovery of the forensic (pig) platform, followed by the primary instrument platform. Dr. Lynne Bell from Simon Fraser University was on board for the day to collect the pig bones. The instrument platform was returned to the seabed that afternoon while the pig platform stayed on board for a later deployment. The next day started with the deployment of the Delta Dynamics Laboratory at the Delta Node, followed by the recovery of several platforms. Technical issues with acoustic releases prevented the redeployment of some experiments that day. The issue was resolved overnight and both the instrument platform and a new forensic experiment were deployed and connected to the Strait of Georgia Central Node (300 m deep) on October 24. That evening, shore confirmed technical challenges associated with the test demo hydrophone arrays, which meant they would not be ready to return to the seafloor during this expedition. The last day of the operations started at the Strait of Georgia East site with the deployment of the VENUS hydrophone array, outfitted with 3 new acoustic elements. With the ROV on deck, the ship then set sail for Saanich Inlet to recover an autonomous mooring at the sill. Once the mooring was on deck the ROV was sent to search retrieve a skull that had not returned during with the recovery of the experiment on the first day. This was the last task on the list and the program had met all of its objectives. The ship headed in to tie up at the Institute of Ocean Sciences (IOS). All in all, it was a successful week, with 10 platforms recovered, 5 redeployed, thanks to 15 dives over the course of 5 days.